A full year of progress by the Friends of HiSAM to enhance and support HiSAM’s work and increase HiSAM and Hawai’i artists’ visibility is wrapping up, thanks to your support and contributions! 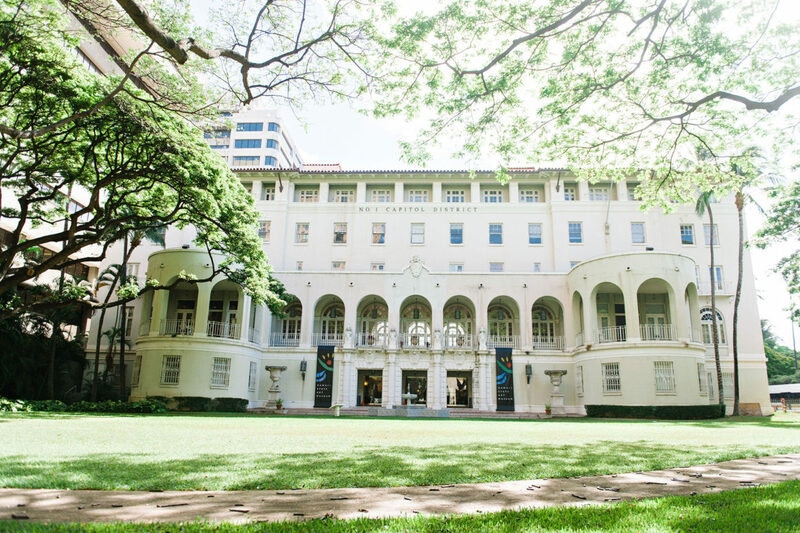 The secondary market sale of Hawaii’s Master Artists Show and Sale of works from private collections in May was a huge success to stimulate new collectors, followed by the 2018 Portfolio, bringing Hawai’i greats, Ashley Bickerton and Paul Pfeiffer’s works back to Hawai’i, joining those of our resident masters, Lawrence Seward, Yvonne Cheng, Kaili Chun and Garnett Puett. A handful of $1000 Portfolio memberships remain if you missed the chance in August. The Portfolio Artists now have a delightful show at the Halekulani’s Gallery, into the New Year. Satoru Abe, Harry Tsuchidana and Hamilton Kobayashi currently have a reunion show at Saks, International Market Place as well. One step at a time, we are getting more traffic to HiSAM and increased visibility for our exceptional artists of Hawai’i. The Head to HiSAM ad campaign continues to get more buzz, thanks to monthly Honolulu Star Advertiser ads compliments of Kahala Hotel, and large light box ads in the shopping malls, thanks to Hawaii Malls, Inc.
A full year of business for the new HiSAM Shop x MORI featuring works by Hawai’i’s own, and Artizen by MW sharing their cafe walls, currently with wax relief artist, Noe Tanigawa and ceramicist, Erin Yasuda’s show, Mitsukeru. Thank you, Pictures Plus – present your FHiSAM membership card for a 10% discount at any of their locations. We are grateful to John Koga and Jodi Endicott for offering their works to be given as gifts for the $350 membership level. BTW, Friends membership grew from zero in 2017 to 286 in 2018! We even managed to facilitate privately donated works of art and art books to Kahauiki Village for their enjoyment. We have more excitement in the works – The Honolulu Museum of Art will be giving free entry to their museum for FHiSAM members at the $100 membership level and above, and an anonymous donor has gifted the #1/50 2018 Portfolio, to HoMA for further enjoyment by the public. Last but not least, we are working on the HiSAM branded merchandise for even more exposure. To close the year, ten of our most esteemed local art aficionados formed the Top Picks Committee to select their 25 favorite works from the SFCA Relocatable Arts Collection’s 6000+ works of art. We will be using this campaign to reach 2 million locals and visitors to increase the visibility of HiSAM and Hawai’i’s artists! The HiSAM building’s facade is refreshed and soon we will have banners purchased by FHiSAM of Madge Tennent’s art marking the S. Hotel Street entrance. Stay tuned for the SFCA Relocatable Arts Collection Top Picks announcement, our 2019 FHiSAM sponsored shows, and continued First Friday’s with valet parking on Richards Street. Thank you again, to all of you who have contributed towards making our state’s cultural arts more vibrant through your contribution and support. Funds generated by FHiSAM are used in a variety of ways to further HiSAM’s goals, including the support, promotion and recognition of Hawai’i artists. Click the Friends Membership page to join, renew, or donate! Mahalo for your support of the Friends of HiSAM and our commitment towards a vibrant local arts community!